In Chittenden County, about 1400 homes and many businesses are located in the APZ’s around Burlington International Airport (BTV). The map below shows the military accident potential zones around BTV, depicted based on the May, 2011, DoD Directive. These same zones can be found in the Draft Environmental Impact Statement for basing F-35 at BTV. If you look at the map and included table, you’ll find that more than 1400 residential properties are located in the Accident Potential Zones (APZ) extending from the ends of the BTV runway into Burlington, Colchester, Williston, and Winooski. It should be noted that these properties represent a much larger number of “dwelling units” since many of them are multiple family buildings. In Winooski for instance, the 974 residential properties in the two APZ’s include about 2600 dwelling units. 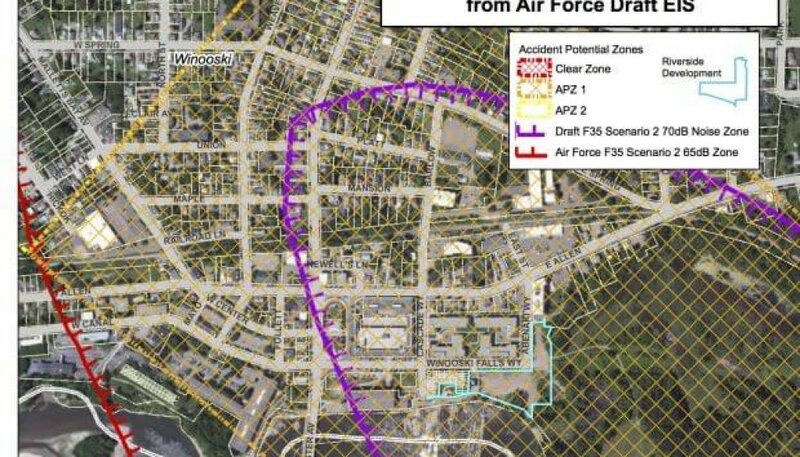 The DoD says, “Areas immediately beyond the ends of runways possess a measurably higher potential for aircraft accidents. . . . residential development, educational facilities, and medical facilities are considered incompatible and are strongly discouraged in APZs.” In Winooski, St. Francis’s School is in APZ2, just outside APZ1. You can read the DoD directive and learn more about the restrictions on development which the DoD says should be in place at this link: http://www.dtic.mil/whs/directives/corres/pdf/416557p.pdf. Once again, it should be emphasized that these are the Department of Defense zones and compatible use recommendations.